The unusual move is because pen-pushing planners at Milton Keynes Council say protecting the tree in Woburn Sands is the only way that they can ensure that it is replaced. Resident Peter Crook had applied to the council to fell one apple tree and one birch tree in Station Road. And while the council has no objection to felling the apple tree, the birch is a different matter. Council planning experts say the birch, although it is in decline, is a ‘large and prominent tree within the Woburn Sands conservation area’, which is ‘leafy’ in appearance. In its letter to Mr Crook, the council says it is considered that replacement planting, following permission to fell the tree, should be sought, in order to preserve the street scenery. “Once the tree preservation order has been confirmed, the council would accept an application to fell the tree,” said the report, opening the door to Mr Crook to fill in another form. > A proposal to knock down a bungalow and replace it with a two storey block of flats in New Bradwell has been withdrawn. C & D Estates had proposed the scheme in Bounty Street, near New Bradwell School, and Milton Keynes Council’s highways expert had raised no objections. But New Bradwell Parish Council and local residents said the proposal for five one bedroom flats would not be a good idea because of the lack of parking spaces and the loss of an old persons’ three bed bungalow. Installation of an art sculpture (Resubmission of 19/00181/ADV). 70 Ambridge Grove, Peartree Bridge, Milton Keynes, MK6 3PH. Permitted. Notification of intention to remove Tree (T1) Ash. The Lodge, Wolverton Park Road, Wolverton, Milton Keynes, MK12 5EP. No objections. Construction of a new digester and MCC kiosk. 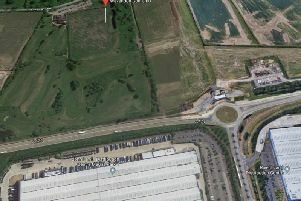 Cotton Valley Sewage Works, Portway, Pineham, Milton Keynes, MK15 9PA. Permitted. Advertising consent for standing sign. Atlantic House, Snowdon Drive, Winterhill, Milton Keynes, MK6 1BU. Permitted. Advertising consent for two new signs on the apex and amendments to the existing gantry. 1 Winchester Circle, Kingston, Milton Keynes, MK10 0AH. Permitted. Listed building consent for repainting of Turkish banner shopfront with addition of fascia sign and new hanging sign. 32 Market Place, Olney, MK46 4AJ. Permitted. Listed building consent to paint the concrete floor and elevations. City Discovery Centre, Alston Drive, Bradwell Abbey, Milton Keynes, MK13 9AP. Permitted. Details submitted pursuant to the discharge of condition 5 (design code) attached to planning permission 15/01074/OUT. Intu, Midsummer Place, Central Milton Keynes, Milton Keynes. Conditions discharged. Change of use from amenity land to garden use and erection of replacement boundary fencing. 15 Kippell Hill, Olney, MK46 5ER. Application refused. Change of use from agricultural land to B8 open storage use 11 storage containers retrospective. Newton Lodge Farm, Spring Lane, Clifton Reynes, Olney, MK46 5DS. Refused. Change of use from dwelling house (C3) to house in multiple occupancy (Sui Generis). 32 Allington Circle, Kingsmead, Milton Keynes, MK4 4EE. Application refused. Erection of bungalow in garden of existing property. Tudor House, Western Road, Bletchley, Milton Keynes, MK2 2PR. Refused. Change of use of a light industrial unit (Class B1 (c)) to four residential units (Class C3). 15 East Street, Olney, MK46 4DH. Application withdrawn.